I am sure that the NSA have good ways of weighing through the rubbish that they glean from the millions of European and worldwide phones/data and emails that the syphon off into their data banks. At least I hope so. They have a very mixed record at actually stopping terrorist incidents to date, and one fears that they are a bit like old fashion stamp collectors, building up a large collection, without ever posting a letter! And what damage they are doing ….! In a world built on alliances and trust, here are these spooks undermining any trust, any sense of camaraderie that they have available to them, by listening into the phone calls of ordinary citizens of Europe and elsewhere, while it is illegal to do the same to their own citizens! How bad is that for allies??? This is not to mention listening into the calls of the Chancellor of Germany, and saddest of all, possibly even our own Enda Kenny. What a threat to democracy he is likely to be! 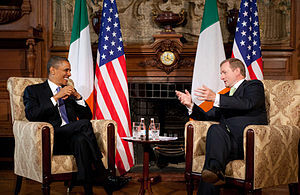 Not to be outdone, Enda sidestepped this embarrassing faux pas by saying diplomatically, that he just assumed that his phone was tapped, and never said anything of note! What a shock…!! I might suggest that if he wants to get his message across, he need no longer rely on the diplomatic channels. It would be far better to ring up his wife, or a friend, and discuss his views over the phone. Surely the NSA will pick it up, and provide a hotline to Pennsylvania Avenue! It really is time the US woke up to the fact that there are other people on this planet, and they need to start treating their allies as equals, or they will indeed end up on their own. Security is one thing, ignorance is another. On a lighter note – check out below! I find it seldom that I appreciate Angela Merkel’s utterances, though I do have a certain admiration for her. She has too much of an eye on her own electorate to be an effective European Leader, and I think she has largely abandoned any ambition of being an Adenauer or a Kohl. Perhaps there is no longer an agenda of greatness attached to leading what has become a failed project, or at least, a difficult cul de sac. However I did agree with her last week when she said she had nothing but contempt for the Irish bankers from the failed Anglo Irish Bank, recorded during the financial crisis, singing “Deutschland über ales” after persuading the Irish Government to underwrite the banks. Far more objectionable was their trite and scandalous treatment of the Irish tax payer. Their contempt for the Government and the Financial Regulator, neither of whom, to be fair, appeared to demonstrate anything resembling competence during the entire financial crisis, was manifest in these recordings. For many years now, the beleaguered Irish tax payer has accepted passively, the incompetence of our Government, and our bankers, but no-one could have reasonably guessed how odious they really were. Listening to these tapes exposes the cesspit of their attitudes and behaviour. It is difficult to believe that these bankers are not in jail, or that not one of them has been put on trial five years after Bernie Madoff, for instance, went to jail in the US. 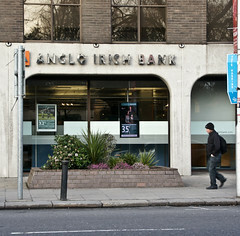 It is even more difficult to believe, that this Anglo Irish Bank is the stable where NAMA (National Asset Management Agency – Ireland’s “bad bank) and the IRBC (Irish Banking Resolution Commission – the clean up operation for Anglo Irish Bank) recruited many of their own staff. The very staff who ran the country into the ground are tasked to clean up the mess. But it gets worse. The Irish Government recently proudly announced the “creation of 800 new jobs” in Capita, whose “Financial management function” includes debt collection and restructuring. This new financial industry will involve the closure and receivership of many an Irish firm. Guess where the staff are being recruited from? Rumour has it that they will come from the recently closed IRBC. So the very people who destroyed Ireland, are not just part of the solution, but are to be the agents of the tidal wave of misery and bankruptcy that is about to overtake the ordinary citizens of Ireland, as the remaining banks try to recapitalize. These are the new Jobs announced by the Irish Government. Yes Angela, ‘contempt’ is a good word for what they deserve. In Ireland it is only a word however, and the reality is that ordinary citizens are under the cosh, and the very people who showed such contempt for the Irish people, are not in jail, as you would expect, but are being recruited to become the carpetbaggers sifting through the wreckage, to extract blood from the corpse!